We are your full service Sand Hollow boat rentals and watercraft service company at this amazing recreation adventure destination. Sand Hollow Reservoir and State park is the most visited lake in St. George and Hurricane, Utah. There are sand mountains which are popular with ATV rentals, powersports, motorsports and motorcycle rentals located within the park. Our premier watercraft rental services offers ATV rentals, jet ski rental, waverunner, wakeboard boats, sea doo’s, PWC’s, and water sport charters and tours at Sand Hollow. After the dam was constructed the sparkling water of a new reservoir laps at the base of amazing trails and hiking. The campgrounds and picnic areas have been developed adjacent to the beaches, which are new and have all the amenities for RV’s and campers. Sand Hollow State Park and much of Sand Mountain have been designated Utah’s newest state park with so many recreational sports available including wakeboarding, water skiing, tubing, kneeboarding, air chair, wakefoil hover glide, and wake surfing. 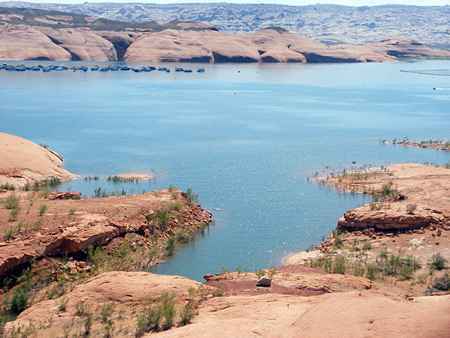 With its warm waters which will last early spring to late fall, blue waters, and red sandstone landscape, this lake has become like a miniature Lake Powell in Page, Arizona. Hike, fish on Sand Hollow Reservoir, explore and ride the dunes of Sand Mountain on an off-highway four wheel drive vehicle, then RV or tent camp in the new campground. The reservoir offers good populations of bass and bluegill fish. Weekends and busy holiday are crowded on the lake and sand mountain; during the weekdays the lake is quiet and not many watercraft. We offer our full service boat tours, jet ski tours, flyboard tours and ATV tours at Sand Hollow.